Sunkissed Pink: Review: My first MAC palette!! 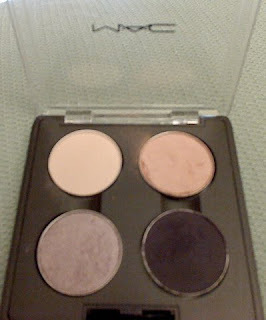 Review: My first MAC palette!! *I youtubed videos to depot e/s and found that using a hair straightener to melt the glue was the easiest and fastest way to do it despite the fumes. I would highly recommend this technique because it takes less effort and gets the job done quick! No need for special scissors to cut the plastic or pliers or whatnot. It actually took a bit more effort and time to take off the excess glue stuck on the e/s pan with alcohol and qtips. The magnetic roll already has an adhesive side which I stuck to the bottom of the e/s pan. 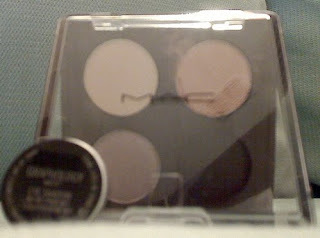 This is sandwiched between the e/s pan and the e/s label (the sticker underneath MAC's e/s container). 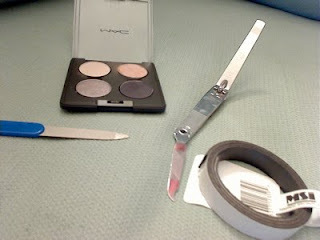 To remove this sticker from MAC's e/s container, I put the container with the sticker side placed onto the straightener and let the glue melt, then I used the nail file to remove the sticker by sticking it underneath the sticker. I stuck the sticker onto the magnet without the use of extra adhesive; the sticker was still sticky after removing it from the container that it didn't need any more to stick to the magnet. *** If you have any questions on the technique I used or the e/s, please comment. Transforming the color of a Lipstick! Review on "My Drugstore Skin Care Routine"